Winner of the Acomb Stakes at York last season, the Tim Easterby-trained Wells Farhh Go had been unplaced in two runs this season but had nevertheless ran with credit in the Dante Stakes and the King Edward VII at Royal Ascot. In both of those races David Allan had tried to settle his mount, but this time Allan was positive, grabbing the lead early and dictating the pace beautifully. Sent off at 7-1, Wells Farhh Go was five lengths clear at one stage, before Allan gave him a breather half a mile out and William Buick loomed up on Loxley. He could never get past, though, and Wells Farhh Go went away again to win by two lengths, with Aidan O’Brien’s Giuseppe Garibaldi a further five away in third. John Gosden’s First Eleven, the 2-1 favourite, never threatened. 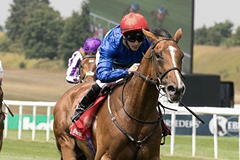 The winner was slashed in price to a general 10-1 chance for the St Leger at Doncaster on September 15. Easterby said: “We had a little bit of trouble getting him to York (Dante) as he had gravel (hoof problem) and hadn’t come to himself. His teeth weren’t right and he wasn’t eating right. “We got him there and he was a bit free and it didn’t go right. We were thinking about running him in the Derby and he had gravel again, so I couldn’t run him. “We ran him at Ascot and he was a bit free, so we decided to forget about holding him up and decided to just let him go. “He doesn’t pull at all at home. He probably pulls because we have been trying to make him do things he doesn’t want to do. He is getting there and by September (Leger) he will be spot on. “It is OK saying the Guineas and Derby are there, but if you aren’t ready you can’t go. There is no point rushing it, you just have to wait until they come right. “I wasn’t worried (when Loxley came upsides), I shouted a bit but he is a proper horse. It is beautiful ground and if a horse can’t race on that you are in big trouble. I’m lucky to have him, really.